Otavalo is a market town high up in the Andean mountains north of Quito, surrounded by volcanoes and inhabited mostly by indigenous tradespeople. The Otavaleños are Quichua-speaking weavers, woodworkers, leather workers and artists, and their market has existed since before the Spanish arrived in this country. Its popularity with both Ecuadorians and visitors from other countries means that it is supposedly now the second most popular tourist spot in the country behind the Galapagos Islands. This doesn’t mean that it is easy to get to. Not. At. All. We had been debating the logistics of making a trip up there since we arrived in Quito (seven weeks ago!). It wasn’t that we lacked the desire to see Otavalo, but our research indicated that it was going to be hellish trying to get there on a budget with two kids in tow. We thought about just heading up one Friday and spending the night, thus avoiding two long bus ride with the kids from Quito and back in one day, but the accommodations seemed to either fall within the “rich gringo stays in secluded hacienda with tour guide, driver and four-star meals included” category or “poor backpacker just needs a cot and a blanket, shower not really necessary” category. We fit into neither of those categories as we are a family with a budget and a desire to see this town as we figured the locals might see it when they come to market themselves – a place to buy some goods, eat some decent food, and hang out to people watch. We also thought about booking a private driver to get there and back, since the bus route is complicated and filled with multiple connections, but it seemed silly to spend so much money to get somewhere where the intention is to save money by buying goods direct from the producers. So, there we were, one week from leaving Quito and still hadn’t found what we considered to be reasonably priced accommodation for a night in Otavalo, which is how we ended up panicking and getting on the bus at 6 am Saturday morning to try and do the whole thing in one day. If you decide to make a trip up there when visiting Quito, please ignore anyone who tells you that it is about “2 hours away”. Maybe, if you are breaking land speed records, driving in the middle of the night, and miraculously avoiding the road construction that seems to continuously plague all mountain roads in Ecuador, it might take you about 3 hours. And only if you are leaving from the FAR north end of Quito. Maybe. We left from the middle of Quito and caught the Metro-Q bus which goes through La Marin bus terminal. From there, we rode all the way through town to La Ofelia, which is the end of the line. That took about 45 minutes. From there, we caught a free transfer bus to La Carcelen bus terminal. Another 20 minutes or so. If you are staying farther north in Quito, you might be able to catch one of the local blue buses straight to Carcelen, or take a taxi there if you’re pressed for time. 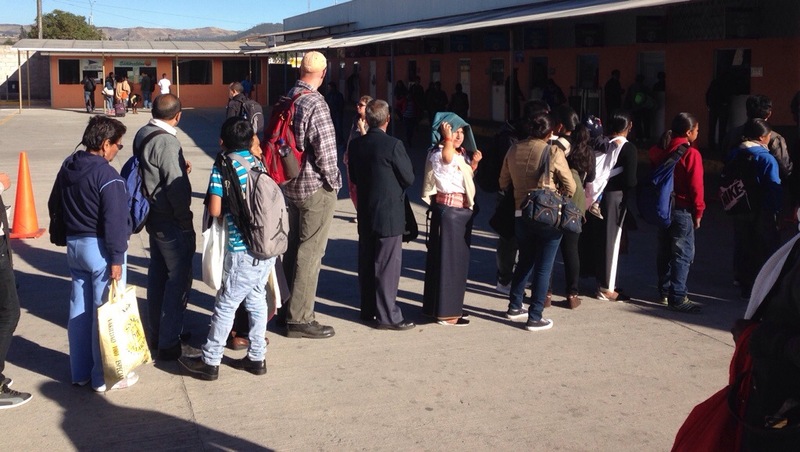 At Carcelen, we encountered the line to buy tickets from Carcelen to Otavalo, which was about 40 minutes long. Tickets are $4 for adults, and $2 for kids who need a seat. My husband is at least 1 1/2 heads taller than most Ecuadorians. While my husband waited in line, the kids and I used the 15 cent/person restrooms (thankfully, because there were no bathrooms on the bus), ate some snacks and watched the hoards of people preparing to head up the mountains to the market. We encountered some other gringos, a rarity for us at Ecuadorian bus terminals, but mostly it was indigenous families dressed in their finest clothing and carrying large bundles of supplies. The clothing worn by Otavaleño women is beautiful – long skirts, white embroidered shirts with hand woven belts and hair wraps, layers of gold necklaces and coral beaded bracelets. Off we went on the bus. It was a nicer style bus than the local affairs, with high-back seats and storage above for backpacks and bags. However, we had been warned not to put our belongings up top or down below our feet, as the bus to Otavalo is notorious for thieves and bag slashers. The road was pleasant and smooth. Around every hairpin turn and at the top of every hill, we were greeted with another stunning vista filled with volcanos and lakes. Traffic was heavy so it was slow going, but we were enjoying the sights. The bus was filled with families and friends chatting amiably to one another in Quichua. Besides the attendant who came through collecting tickets and the food vendors, we didn’t hear Spanish at all the entire trip. Every time traffic would slow us down considerably or bring us to a standstill (which was often), the driver would throw open the door and food vendors of various type would climb on board to walk up and down the aisle selling their wares. There was a man with a giant tray of empanadas (chicken and beef), a woman with buckets of ice creams, and a man with bottles of coke tied to a rope slung over his shoulder. We had brought our own snacks (a habit now ingrained in us after months of travels with little ones), but nearly everyone else on the bus bought something or other to nibble on. Maybe because our two-year old was getting frustrated, or maybe because we had anticipated the trip to be much shorter, the ride grew to be agonizingly long. As the hours passed, I was absolutely regretting the decision we had made to try and do this trip in one day. Every time we would climb up another mountain into another Andean village, I would look over at my husband expectantly while my son jumped up and down on my lap shouting that he wanted off the bus. By the time we finally arrived in Otavalo, nearly six hours after leaving our apartment in Quito, I was miserable and grouchy and not looking at anyone. We emerged slightly discombobulated, onto a packed street outside the bus station, not sure which direction was the market or where anything was for that matter. The kids were starving and I was already dreading the return trip. 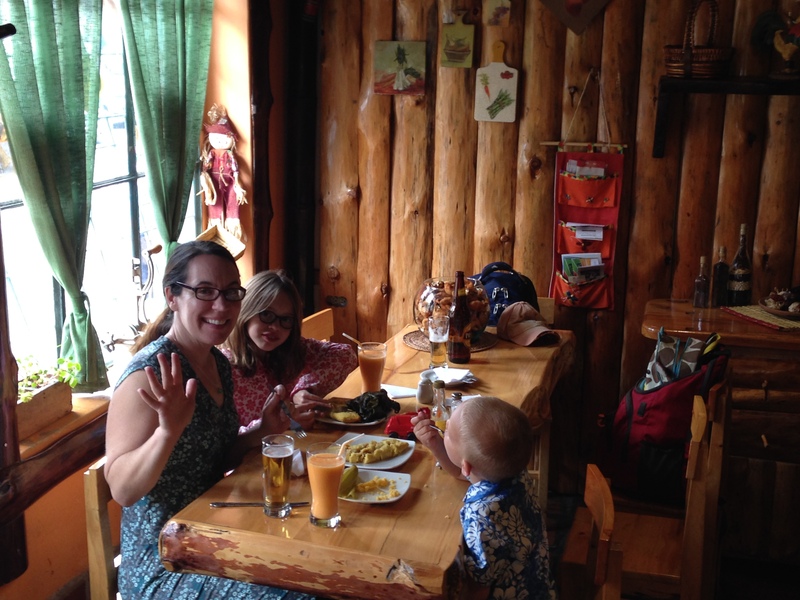 We wandered aimlessly for a bit and found a restaurant that looked decent. After refueling with an Ecuadorian version of Mexcian food, juice and dessert for the kids and a beer for us, we felt well enough to start shopping. 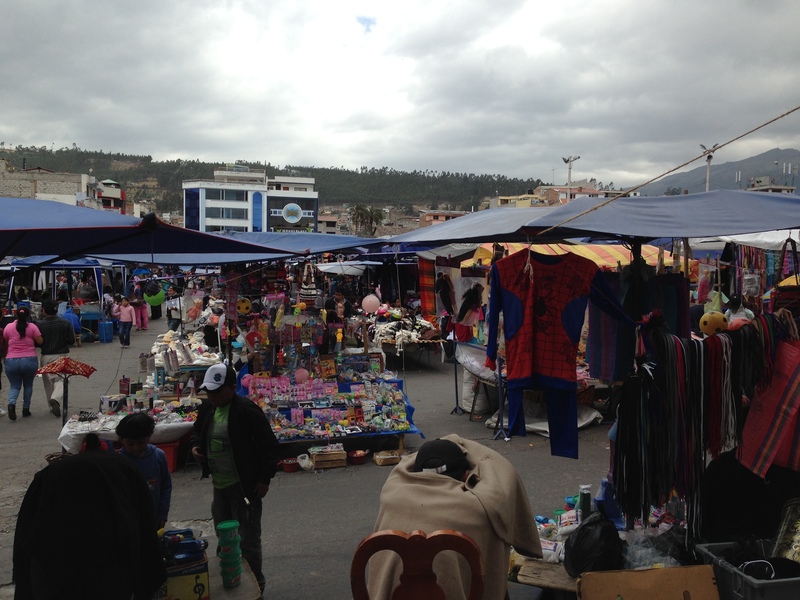 We hadn’t really had anything particular in mind that we wanted to buy in Otavalo, and some of what we saw was machine-produced, cheap junk. However, some of what we found was hand-made and beautiful. In the end, we had to find an ATM (twice!) to take out more money than we had anticipated spending, but were happy with our purchases. We ended up with some soft, warm sweaters (whether or not they are actually Alpaca is up for debate – but they are still lovely), a hand-woven wool hat and jacket, a wood carving, knitted toys for the kids, little purses for my daughter, blankets, an embroidered shirt, a big purse for me, and a shawl. Since we hail from a cold-weather land, we knew that all of this would be put to good use eventually. We are traveling for another 9 months, so these items will be sent home next week not to be opened up again until our final return, which I picture will be a little like Christmas in the summer with a box from every country we have visited. We found for the most part that the Otavaleños were friendly and warm. Just like we have experienced in Quito, people took the time to ask us where we were from and enquired after the kids. Also just like in Quito, people would stop and stare at our son and remark on his light coloring and blue eyes, and maybe even reach over and pat him on the head. He is used to the attention now, and paid absolutely no mind. 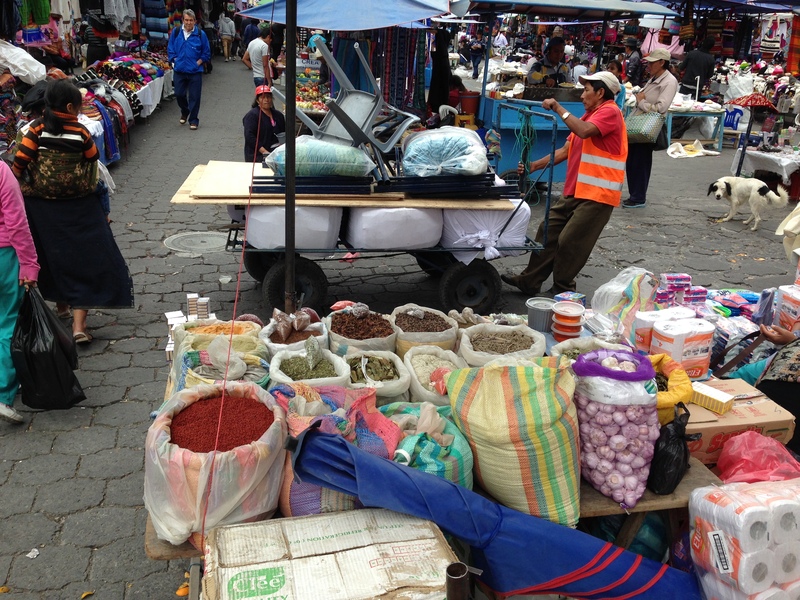 Even though we continued to hear Quichua spoken throughout the market, Spanish appeared to be the language of buying and selling. Some vendors also spoke some English, as there were tons of gringos wandering around (who obviously hadn’t taken the slow bus from Carcelen!). We finished up our shopping in about 3 hours, and wandered back over to the bus station, where we once again paid for a trip to the bathroom and bought some snacks. We also for the first time on our entire trip encountered one of the infamous bus thieves! The reason you are warned not to put your bags on the overhead shelf is that there is a popular scam where men pose as bus attendants, helping you put your bags up top and a bit out of your sight, and then when you aren’t looking, they grab your bag and exit the bus (the bus will stop anywhere – you just have to ask). Well sure enough, as we boarded, a friendly looking man approached me on the bus and asked if I was headed to Quito. “Then wouldn’t you be more comfortable putting your backpack up top?” he asks, gesturing to the shelf above. “No, its fine here!” I answered in my grumpiest spanish, clutching it on my lap. He sat directly behind my husband, so we were careful not to put any bags on the floor either. About 2 minutes after we pulled out of the bus terminal, the attendant came around to collect money. This man said that he had been quoted a different price before boarding, and didn’t have enough for the ride to Quito. The attendant started shouting at the man that he “should know better!” and ordered him immediately off of the bus. The driver stopped in the middle of the busy street (!) and the man ran off. The rest of the trip home was uneventful. My son took a blissfully long nap, giving us all a break, and we were prepared for how long the trip would take so we weren’t anxious about the time. 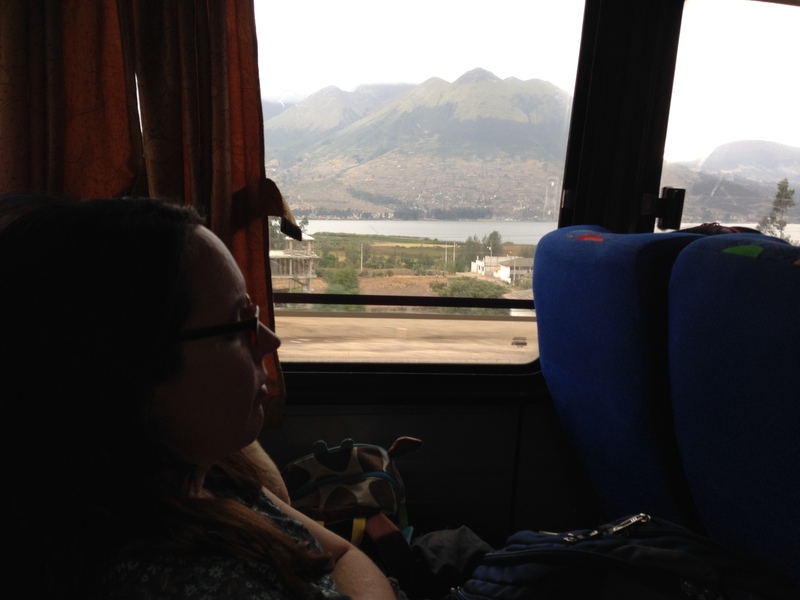 Catching a snooze on the bus with volcanoes and lakes in the background. The only excitement came on the transfer bus between Carcelen and La Ofelia. It was dark as we boarded, and I immediately had the feeling I was climbing into a disco. The lights were dimmed, the music was obnoxiously loud, and the driver had decorated his little area with sparkly lights that flashed on and off when he applied the brakes. The driver was a maniac, and even by Ecuadorian standards the bus was driving recklessly fast. He ignored the shouts of “mas suave!” from the passengers who were unlucky enough to have to stand (we always get to sit, every time, because we have kids – Ecuadorians by and large are extremely polite on their buses), and the bus wove precariously in between slower cars. At one point, the driver zoomed up to the tailgate of a cement truck and slammed on the brakes when traffic slowed. We gave a sigh of relief when we made it to La Ofelia, and were able to board our boring and predictable Metro-Q bus for the long ride across central Quito and home. 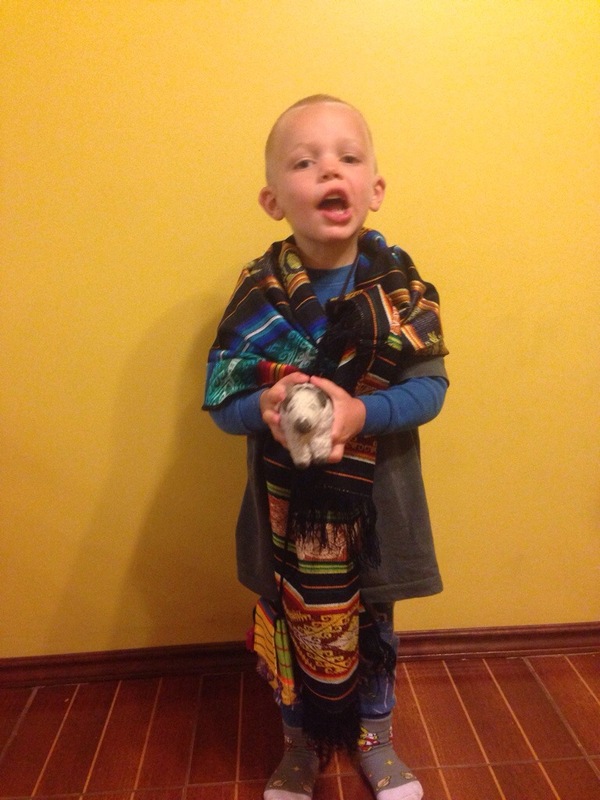 Although it was late and we were all very tired when we finally made it home, the kids were very excited with their new things from Otavalo. 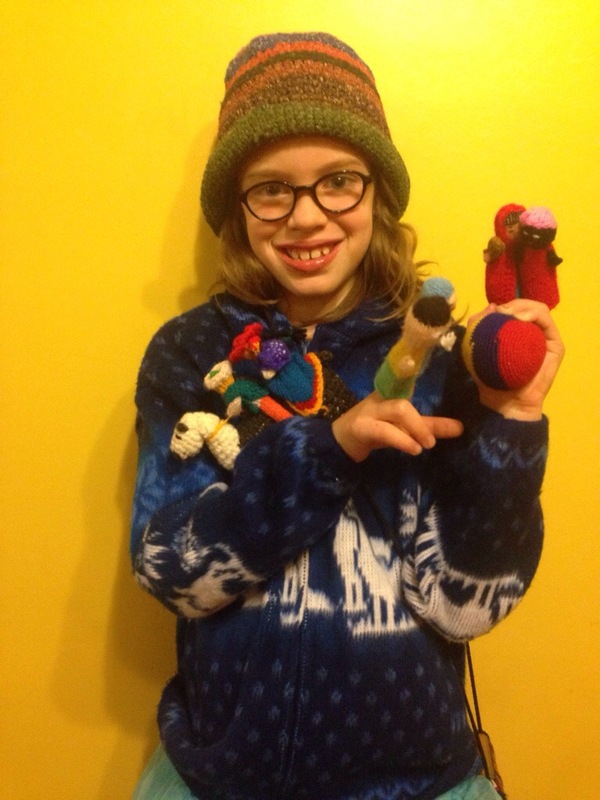 My son slept with his knitted, one-horned cow that night, and my daughter wrapped herself up in her sweaters and purses and demanded that we take pictures. By and large, I would say that the trip was a success. 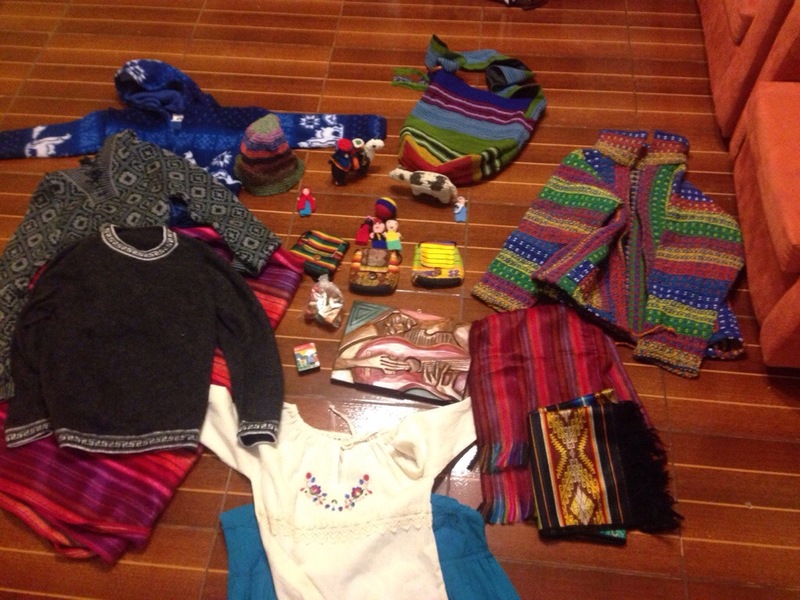 The kids enjoying their Otavalo loot. Fabulous!! 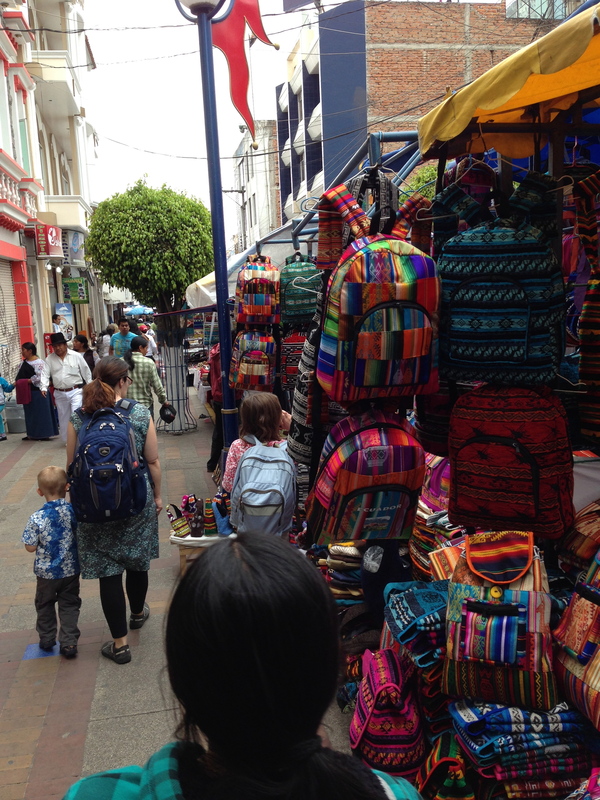 I had such a great time when Lulu and I spent 5 days in Otavalo…! And I am super happy to hear that you survived the bus unscathed by thieves!! Youppiiiiii!! We were pretty happy to have thwarted the famous bus thief!